Oracle-BEA WebLogic is not a technology I want to dive deeply into with this web site; however, it is often the Java Application Server of choice for many Business Objects XI environments because of its scalability and it tends to be preferred by other business technologists within companies. I personally work/struggle with it a lot and so I thought it a good idea to share a few issues and their resolutions in this article. I also would welcome anyone else to share their war stories as well. Be warned, I am writing this article to those who are already familiar with configuring/deploying BOXI on WebLogic. This issue may be specific to Windows operating systems or it might apply to others as well. The symptoms are that you can run Node Manager from the command prompt but you cannot run it as a service. CAUSE: If you have encountered this issue, look immediately at your “Path” environment variable. Is the final character a backslash ( \ )? If so this could be causing the script run by the service to fail due to some faulty programming. Most likely someone or some automated script/patch altered the “Path” variable and the problem did not occur until WebLogic was restarted. 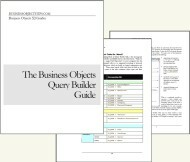 This issue actaully has nothing to do with Business Objects. FIX: Just remove the backslash ( \ ) as the final character. If you really want you could also append a final semi-colon ( ; ) at the end. This may be a Unix/Linux only issue. When deploying Business Objects XI applications such as InfoViewApp, CmcApp, PlaformServices, or AnalyticalReporting you notice that you can never get them all successfully installed or started. Individually they may work just fine, but with all of them installed you suddenly start seeing infinite down apps and “Start running” status messages when you start them up. If WebLogic starts to feel like the twighlight zone you should start to question if it is hitting limits imposed by the OS. CAUSE: There is an OS level setting that limits how many open files a single session/instance can have. In Linux this is stored in the “ulimit” under the setting “open files”. If this setting is too small (less than about 2048) you can expect issues. This is due to the fact that Business Objects applications/deployments have a very large number of files and WebLogic “opens” them all during deployment and application serving. FIX: Increase the ulimit for “open files”, a.k.a. “nofiles” to 4000 or 4096 if you like. This should not impose any security threat to your system; however, after running the command “ulimit -a” you may discover that the limit imposed by your OS is too low to allow this increase. In such case, get it increased (see “etc/security/limits” or SAS has a good web page on this, too bad BO has no official comment on the topic). Keep in mind that you will need to also tell WebLogic to use more of these open files. The best way is to do so by appending a line in the “commEnv” file located in the “/weblogic/common/bin” folder. This is one of the most perplexing issues because there are not errors to point you in any direction. In short, the Admin Server cannot be started successfully via a service or via the command prompt. If watched closely you see that it progresses fine for a couple seconds and then it freezes. If you look closely at running it through the command prompt you will see that the last entries (“”) are related to security; this is your only helpful clue. CAUSE: The “ldap” directory has become locked or corrupted by some errant process. FIX: Stop all WL processes. Rename the “ldap” directory or compress it and delete it. Start the Admin Server. Viola! You just fixed it. WL will recreate the “ldap” directory. If you don’t even use WebLogic’s LDAP functionality then just move on, if you do use it, you may have some work still left to do. Alternatively you could look for the “lock” file (*.lck) and delete it. Please feel free to share your own BO-WebLogic issues and their solutions. I hope this article becomes a place to share some successful resolutions and not a place to ask for help with WebLogic. There are better qualified web sites for that.